Most of us will grab our books from the bedside table at night and will probably fall asleep after a few quick minutes. But how could we not? Our bed is so comfortable and our day routines leave us generally so tired that our sheets, blankets and everything else lull us into the land of the dreams without even noticing. Unless of course you have insomnia or the book is so damn good that you’re afraid it’s going to be one of those nights where you won’t sleep… but that’s another topic. But let’s face it, unless you don’t feel tired, the bed is not always the best place for reading. And if you fall asleep while reading, how many times have you woken up to find the cover of your book bent, and twisted in between your sheets? 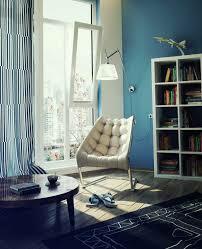 Reading is a special experience and I believe it’s a good idea to have a reading corner besides the bed. And if you have the space (you really don’t need much, that’s why it’s called “corner”) investing into it is definitely worthy. We spend too much money in acquiring these magnificent couches to place them in front of the TV. 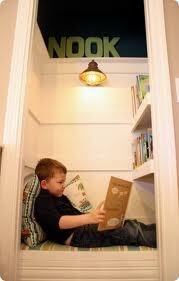 Why shouldn’t we invest in a nice place for reading? A corner that drags you into this world of books and makes you want to spend Sunday afternoons or rainy days in it, with a cup of coffee on the other hand. And even if you don’t use it, they actually look awesome as decoration. 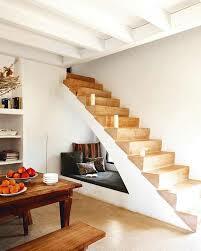 A clever idea is to find a place in your house/apartment/flat where you wouldn’t jeopardize too much space. If you have stairs, then you’re done. The pictures below can give you good ideas. Windows are also an incredible option. These images display some interesting ideas. I must confess I don’t have the proper credits for the pictures. They have resided in my computer for many years in a folder called “dreamed house” yeah, I know… but it’s good to dream (some day, maybe I’ll get to use all of them for real) Meanwhile, I continue feeding my inner interior decorator with the most tangible tool: Pinterest! You don’t need too much furniture to improvise corners like these ones. Take advantage of some cushions with vibrant colors and textures. (they say bright colors are better… I couldn’t agree more). 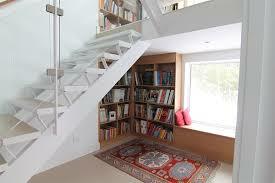 If you don’t have the possibility to have a window in the chosen space, you could install some lights under the stairs. In fact you don’t need a complex electrical installation, there all sorts of LED lamps and LED candles out there. Be aware you might also need curtains if you’re near a window, sometimes the reflection or the lightening from thunders (yeah, I had to think of all possibilities) could interrupt your reading. Or maybe you just don’t have a nice view, and you don’t feel like staring at a brick wall or having the sensation that a neighbor is eavesdropping at you (again I had to think of all situations here… please feel free to add more in the comments if you come up with something I haven’t thought of). Overall, when you build/install these corners, take into account two factors: lighting and comfort; this will help you submerge into your reading without any distractions. 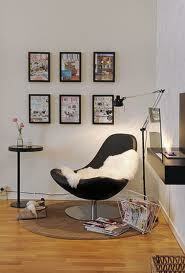 Additionally, take into account that chair or couch you use is as comfortable as possible. You could take advantage of modern designs or retro chairs that could be as different as you want from the rest of the room, not only in design but in color as well. To enhance the place, you could use one of those standing lamps that not only look terrific in their design, but also help at the time of reading. Another brilliant idea is to adapt your wardrobe or wall spaces, and make them into hidden and comfortable reading spaces for you. You can use them to distance yourself from the rest of the world, grab a book, and spend hours in it. Add some shelves and cushions inside this space (I bet you’ve realized that I love cushions) A lamp installed in the wall will also be a perfect addition to this reading closet. 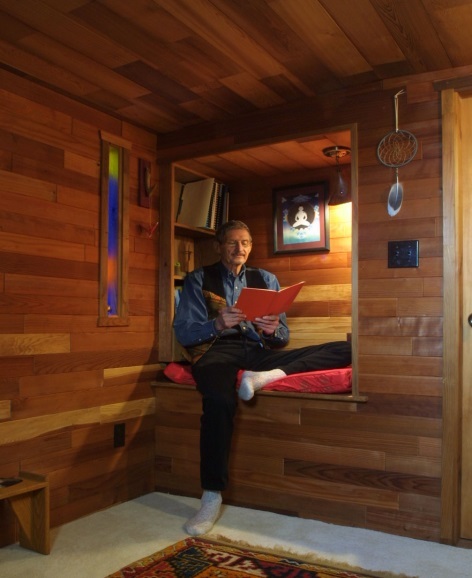 And you, do you have any reading corners in your place? any other suggestions for these reading corners I have not taken into account? I’d love to hear from you. Although I would prefer to read in the living room where I have a fantastic reading lamp and an overstuffed chair, I always end up in the bedroom with four pillows behind my back against the wall. This probably comes from all those years growing up when my bedroom was my sanctuary.